Sharing is caring! When I hear about new ideas or learn about cool tools to use on the Internet, I am going to link to them here. Have fun using some of these "toys" for your brain!! Think about ways to incorporate these Web 2.0 devices into your projects and your reading and writing activities! Blabberize is a very fun tool that allows you to upload any picture, add audio and a "mouth" to get your blabber to talk. I encourage you to access their site as I am still giggling about their intro. What a great way to "interview" a character, talk about a book, teach a new concept... You can have conversations between your blabbers, use accents and funny voices and create great projects! "The Super Hero Squad site is the Internet hub of all things Super Hero Squad. The site is designed to entertain and educate children using Marvel Super Hero Squad's library of renowned characters such as Iron Man, Wolverine, Hulk, Thor and many more. From videos to games to challenges and other kid-friendly programming, SuperHeroSquad.com strives for responsible excellence when reaching out to its youngest fans. SuperHeroSquad.com, MarvelKids.com and Marvel.com are part of Marvel Entertainment, Inc. -- a company rooted in the creative success of over seventy years of comic book publishing. With a library of over 5,000 characters, Marvel is one of the world's most prominent character-based entertainment companies. In addition to digital publishing via SuperHeroSquad.com, MarvelKids.com and Marvel.com, the company's areas of emphasis include feature films, DVD/home video, consumer products, video games, action figures and role-playing toys, television and promotions." "Voki is a free service that allows you to create personalized speaking avatars and use them on your blog, profile, and in email messages. Voki enables users to express themselves on the web in their own voice using a talking character. You can customize your Voki to look like you or take on the identity of lots of other types of characters… animals, monsters, anime etc. Your Voki can speak with your own voice which is added via microphone, upload, or phone. A ridiculously easy and simple Web 2.0 tool that could be used with limitless creativity. I highly suggest this tool for those thinking about character development. PowerPoints are sooo yesterday! Prezi is a great new way to produce quality presentations for classes. Impress your teachers (teachers, impress your students) with active and multi-media projects for your classes. You do need to create an account to this FREE site; there you will be able to save all of your prezis. Before you jump in, take the time to view the tutorials and to explore some of their best examples. You don't want to give your audience motion sickness! PicLits.com is a great website to use photos and words to create all kinds of imagery-rich poetry, prose, messages or even projects! Explore this site for examples and create your own. Your imagination is the limit! See the examples below for inspiration. Need to reinvent the old shoebox diorama? Try Museumbox.com. This site uses an old techinique first employed by abolitionists to decry the plight of slaves in America. You can use it to create a "box" of information about any topic! As simple as copying and pasting and writing a bit of text, try Museumbox for your next project! 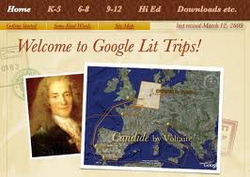 At this site, you can create an entire travelogue based upon a book, a historical even, even a creative work of your own! Plan an itinerary for King Richard during the Crusades, follow George and Lenny across Salinas County, set sail with Odysseus, or disappear Into the Wild with Alex McCandless. Your inspiration and imagination can help to develop a fabulous interactive trip into your text or topic. You will need to set up an account (FREE!) and from there look at some other students' work for inspiration!